The company, Research in Motion, which makes the BlackBerry smartphone also owns a company called Plazmic. Plazmic makes a software package called Content Developer’s Kit that can be used to create custom BlackBerry themes. 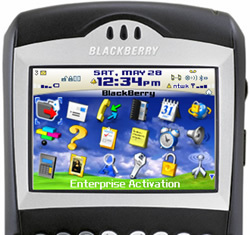 To install BlackBerry 7290 or 7250 themes, you will need to do three (3) things. First is to upgrade your device operating system to RIM-OS 4.1 because when BlackBerry 7290 or 7250 first came out, it only had OS 4.0. The second thing you need to do is to install the Plazmic theme reader. The third is to make sure you restart the device after step 2. After these three steps, you can use App Loader or OTA to install your new themes. All you need to do now is to find some pretty themes for your BlackBerry 7290. Proceed to the next page you will find some download links for themes I have found on the internet. For themes for your newer BlackBerry smartphones, check out Blackberry 8830 themes or Blackberry Curve themes.